Don’t you just love fortune cookies? You crumble it open to pull out that tiny piece of paper and you get to see what the future has in store for you! Or at the very least, get a small inspirational message to get you through the day. Now you can have all the fun of opening a fortune cookie right on your iPod with the Fortune app for the iPhone or iPod Touch. Download this free itouch app and when you open it, you’ll see a fortune cookie on your screen. Simply give your iPhone or iPod Touch a gentle shake and the cookie will crumble apart to reveal your fortune. Sometimes, it may take more than just a gentle shake to rip that cookie apart. If you find that the cookie doesn’t come completely apart, you can also tap on the cookie and it will crack and crumble to reveal your fortune. This fun iPhone app is actually quite addictive. And there are thousands of fortunes just sitting in the Fortune Cookie database, waiting to be found by you. This means that you can try to get your fortune again and again and you’re likely not to get the same one twice! 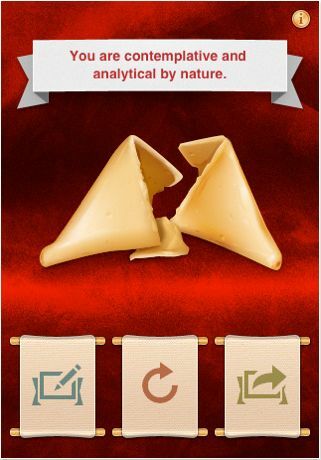 Download this Fortune Cookies iPhone App here!